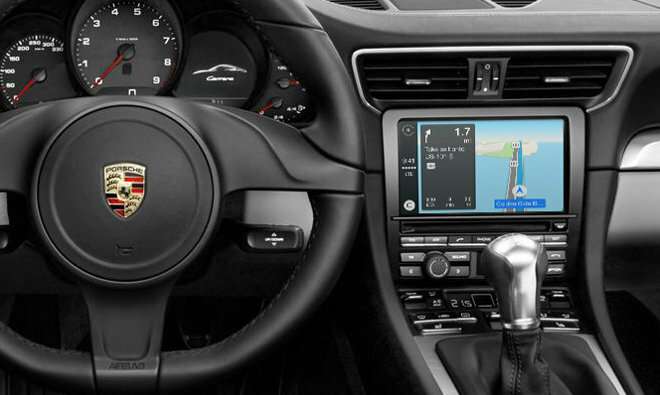 Porsche is the latest brand to commit to CarPlay after Apple CEO Tim Cook last month said all major car manufacturers plan to incorporate the third-party infotainment platform in models rolling out this year. The previously unreported addition to the CarPlay lineup came sometime in mid-March, according to Internet caches of the website. Porsche owner Volkswagen Group is offering substantial CarPlay support across its marques, including Audi, SEAT, Skoda, Suzuki and Volkswagen. It is not yet clear how or when the Stuttgart luxury brand plans to build in compatibility, as the company has already developed a fairly comprehensive in-house solution called Porsche Communication Management. PCM offers the usual assortment of niceties like GPS navigation, voice control and digital audio, but bakes in advanced features such as speed limit indicators called up from data stored in the system's navigation database. In its fight for the dashboard, Apple faces stiff competition from stalwart industry players and fellow tech companies like Google and Microsoft. Google is pushing an Android Auto platform similar to CarPlay, while Microsoft last year saw its Sync tie-up with Ford dissolve, to be replaced by a new iteration powered by BlackBerry's QNX. Aside from buying a new car, iPhone owners can get access to CarPlay by swapping out stock head units for compatible hardware made by aftermarket audio companies like Alpine, Parrot and Pioneer.